Shelter #5 will be closed until further notice due to construction on the restrooms located by Shelter #5. 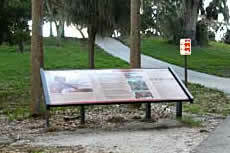 A Native American mound and majestic shade trees welcome visitors at the oldest park in Pinellas County. Take in the view of Old Tampa Bay while strolling along a one-mile shoreline. Enjoy picnicking, fishing, and historical points of interest. 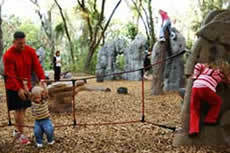 Kids love the playground, a rock climbing park, ball field, and open spaces to roam. A public boat ramp with access to Tampa Bay is open during park hours. Philippe Park was acquired in 1948, making it the oldest park in the county. This historically rich park bears the name of Count Odet Philippe who introduced citrus culture to Florida. The existing park property was part of the original Philippe plantation from which several citrus trees still remain. One of the more colorful figures in Pinellas County’s past, Odet was the first permanent, non-native settler on the Pinellas County peninsula, acquiring 160 acres of land in what is today Safety Harbor in 1842. He was a successful businessman who introduced cigar making and citrus to Tampa Bay. His descendants, including the McMullen and Booth families, are among the county’s most well known pioneer clans. Philippe was buried in the park – his former plantation – in 1869, but the exact location of the grave site is not known. No road closures at this time.